Roof Domes are a staple of architecture since Roman times, is among the strongest and most spacious structures possible. It is also craftsmanship difficult to build on-site from typical building materials. Roof domes, on the other hand, are durable, reliable, beautifully assembled in the shop by a qualified metal fabricator. They’ve been in use in Europe for centuries, and adorn some of the most famous buildings in the world from the Taj Mahal to the US Capitol Building in Washington, D.C.
Triangle Roofing Company manufactures custom roof domes for new construction, renovation or expansion project. One can choose from a selection of pre-designed domes that can be easily fitted to any architectural application. Metal Roof Dome fabrication for decorative domes and custom dormers for a building project can be designed with a variety of durable metals. Decorative dormers can be fabricated from zinc, titanium, steel, aluminum, copper and a number of other sustainable metals. Triangle Roofing Custom metal dormers and decorative metal domes come in different shapes. Custom fabrication allows for the standard dormer to be transformed into an angular or round exterior accent. MetalTech-USA fabricates gable dormers, barrel dormers, half round dormers, flat roof dormers, and hipped dormers. The potential for unique designs for the custom dormer is great, for all decorative dormers are able to be fabricated in a variety of dimensions and slopes. 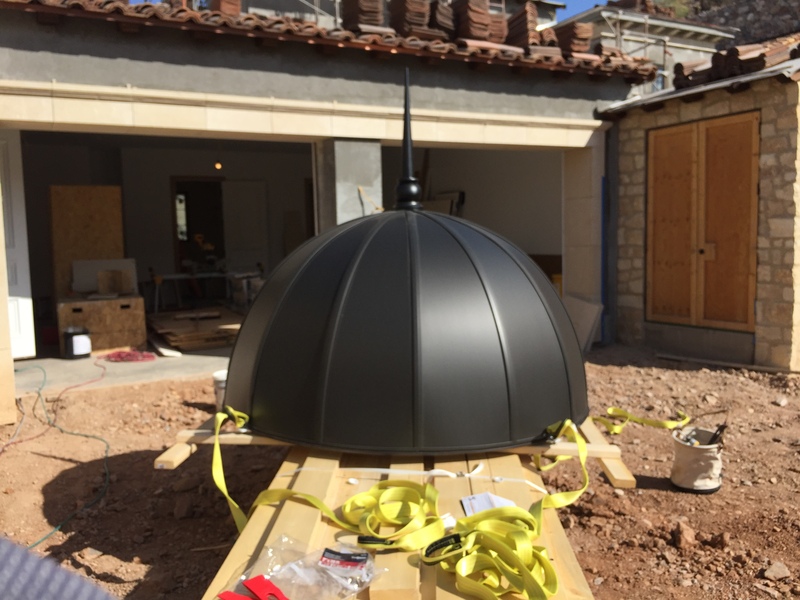 Metal Roof Domes have been called “the kings of all roofs,” and they now cover some of the Arizona’s most important buildings. Domes are curved structures that have no angles or corners and enclose an enormous amount of space without using any supporting columns. Design Note: Triangle Roofing pre-fabricated Domes are watertight. For some field installations, where watertight applications are needed, an underlying roof must be included in the design. The possibilities for design and creativity are endless with this type of roof. Whether it is to be used on a private home or commercial building, it becomes a focal point of the structure. Our hemispherical dome roofs are lightweight, yet self-supporting due to the design. With no interior support, they can actually become a part of the totally open interior space – so let your imagination run wild! If a hemispherical roof doesn’t fit your needs, we can manufacture a roof according to your specs. No other style of roof creates such a feeling of spaciousness. These domes add an unsurpassed air of sophistication and richness. For a unique combination of quality, function and design, merged with elegance and style, include a domed roof in your next building project. We manufacture strong, durable Metal Roof Domes for all circular structures with diameters of 10′ to a maximum of 12” for prefabricated domes. Customers can select from a variety of colors and finishes, as well as acrylic Galvalume, known as Galvalume Plus. Examples of installations can be seen in the Photo Gallery. Metal Roof Domes are shipped in stacks of pie-shaped steel sections are turnkey and ready to be craned in place. Panels are radiused and their edges are roll-formed into channels at the factory. These are then nested together and bolted together during assembly resulting in a rigid and beautiful free-standing structure. Metal Roof Dome can be used as an architectural detail or can become an integral part of the building structure, providing a breathtaking inside view. Domes are available with a base diameter from 10′ to 12′. They can be produced as perfect hemispheres or can be formed into more exotic shapes.The domes are typically manufactured from Zinc which can be prefinished with a wide range of colors. Installation of these domes is quick and surprisingly economical. 9419 E San Salvador Dr.